Complement your outdoor living area with the finest in quality and practicality, with the perfect companion to your outdoor kitchen, the Firemagic 15" Anodized Wok with stainless steel cover. 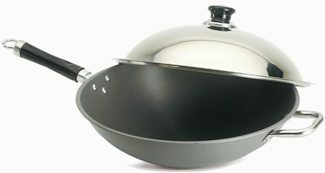 Those who love wok cooking will want this large, heavy-weight aluminum pan with stainless lid. The hard anodized stick-resistent surface, measures a full 14" in diameter and has ample depth of 5".